As a last excursion in Chile, my friend Jena and I traveled to Chiloé. Chiloé is an island off of Chile in the south. With very little planning, we traveled by airplane from Santiago to Puerto Montt. In Puerto Montt we caught a bus to get to the island, in which we had to cross water by taking a ferry. We had planned to spend our time in the city of Castro, which was in the center of the island, so a 4-hour bus ride we embarked on! The idea was to see Chiloé in less than 4 days and having done little research, no one told us it would be raining ALL DAY and EVERY day that we were there. Thankfully we are both adventurous people and enjoy the excitement of the unknown, because I’m sure anyone else would have been disappointed with the amount of rain. Nonetheless, we happened to stay in one of the most awesome hostels (it was a Palafito=house on stilts over water) and ventured out to explore during the day. We ended up in Dalcahue after taking a bus for a while and explored the small fishing village at the edge of the island for an afternoon. Here we tried “Curanto”, which is a traditional food of Chiloé Island consisting of various types of meats, shellfish, potatoes, and other “mystery pieces”. This was an experience in itself and probably the weirdest thing I have ever eaten. *The photo is worth viewing* Although, we didn’t feel our time in Chiloé was complete, it was a relaxing and interesting 3-day excursion. I want to go back! 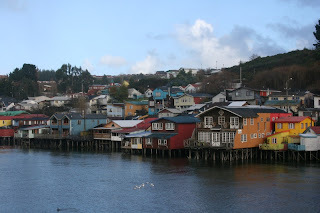 Click on the "Chiloé" album to see photos here.